Mapping eelgrass, current and historical populations, is an important tool for management and restoration. The maps generated from historical photographs provide information on former extent, changes over time, and correlation loss/changes with events (e.g., disease outbreaks, hurricanes, anthropogenic activities, etc.). This data combined with current distribution, can then be included in restoration or management models as baseline data in order to select appropriate sites for restoration or to plan management actions. Eelgrass mapping efforts for Long Island have been limited and had little coordination between the three estuaries (Long Island Sound, Peconic Estuary, and South Shore Estuary Reserve). There is currently a movement backed by the NYS Seagrass Task Force (learn more..) to coordinate eelgrass mapping on Long Island and standardize the methodologies used for all aspects of the mapping project. There are several completed eelgrass mapping projects for all three of the Long Island estuaries. The SSER has had several small-scale mapping projects completed for various parts of the estuary in the past, with the most recent estuary-wide map completed in 2002. 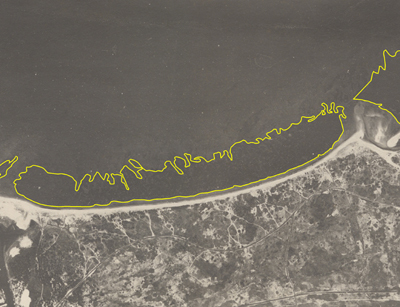 The Peconic Estuary has been the focus of several mapping projects starting in the late 1980s with Dennison and Cashin and Associates, then EEA in the 1990s and ending with the most recent survey completed in 2003 (based on aerials flown in 2000). Eelgrass mapping surveys for Long Island Sound include 2002 and 2006. New surveys for the Peconic Estuary and SSER are planned for summer 2008. Long Island Sound has a survey slated for 2009 for eastern half of that estuary.